At the second time of asking, architects OMA have managed to smuggle their plans for a re-jigged Commonwealth Institute past the cultural gatekeepers at Kensington & Chelsea council. The building, a holdover from the brief post-war flourishing of postcolonial optimism, has been unoccupied for a few years, and was the subject of a proposal to rebrand it The Parabola, a development encompassing a new home for the Design Museum and the requisite number of luxury flats to make the project amenable to the bean-counters. That plan was held up when the Council, in agreement with English Heritage and the 20th Century Society, wisely judged that surrounding the Institute in looming tower blocks wasn't kosher. Having gone back to the drawing board, the architects submitted a revised plan which makes the towers less prominent and incorporates the existing front courtyard, which was all but bulldozed in the original plan. Kensington & Chelsea have okayed it, and English Heritage will give it the once-over next week, but it's expected to be rubber-stamped by them as well. 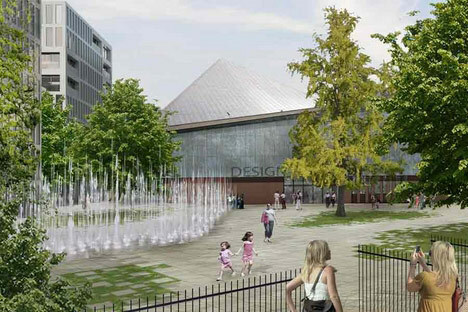 A move-in date of 2013 for the Design Museum has been mooted. All of which leaves us with a rather striking old warehouse in Shad Thames that will shortly need an occupant. The Design Museum has called the Forties-built building, one of the best examples of International Style modernism in London, its home since it opened in 1989. Though it may, as curator Deyan Sudjic attests, be too small for the Museum's burgeoning collection, it's still roomy enough. Any suggestions as to what should move in there?